For her birthday, Zoë wanted a strawberry Llama Llama cake so a strawberry Llama Llama cake is what she got! It turned out rather delicious and it was hardly more complicated than the regular instructions on the box (thank goodness). On Tuesday I whipped up a batch of buttercream frosting and a batch of marshmallow fondant. I dyed the fondant all sorts of colours and then I let all four kids (excluding Alexander because he isn't a kid yet, obviously) go wild. They each made their own pattern, which we rolled flat, and then cut into "quilt squares" for Llama Llama's bed. My perfectionism, patience, and tolerance for mess-making were pushed nearly to the breaking point, but the kids enjoyed themselves. Whenever I have ideas like this I think, "I can totally handle four kids playing with fondant and powdered sugar. This will be fun!" And then about in the middle of the execution of the idea my mind starts screaming, "Why did I think I could handle this?!? Everyone I love and everything I own is covered in powdered sugar and I think my left eye is twitching!! There is no recovering from this!" But then we get to the finished product and I see how proud the kids are of their work and it makes all the chaos and clean up worth it (at least, that's what I keep telling myself). The quilt isn't quite what I envisioned, but it's our quilt. 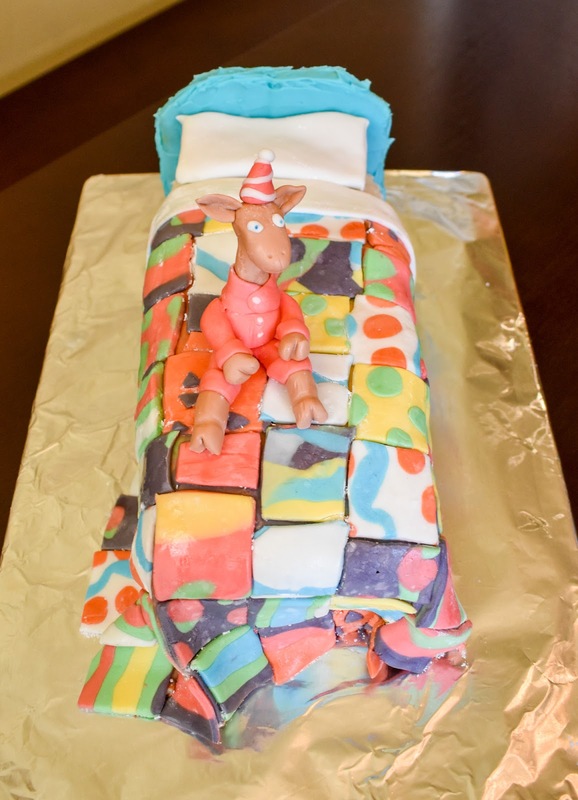 The pillow is a piece of cake (shaved off when I flattened out the layers) wrapped in fondant, and the headboard is graham crackers covered in icing. I made the little Llama Llama after I put the kids to bed. They were all pleasantly surprised when they saw him sitting on the cake because when we'd finished piecing together the quilt squares they asked me if I was going to make a Llama Llama and I looked around at the sticky mess covering the entire table, all of the counter tops, and all of my children, and was like, "Uh-uh, no way, no how!" 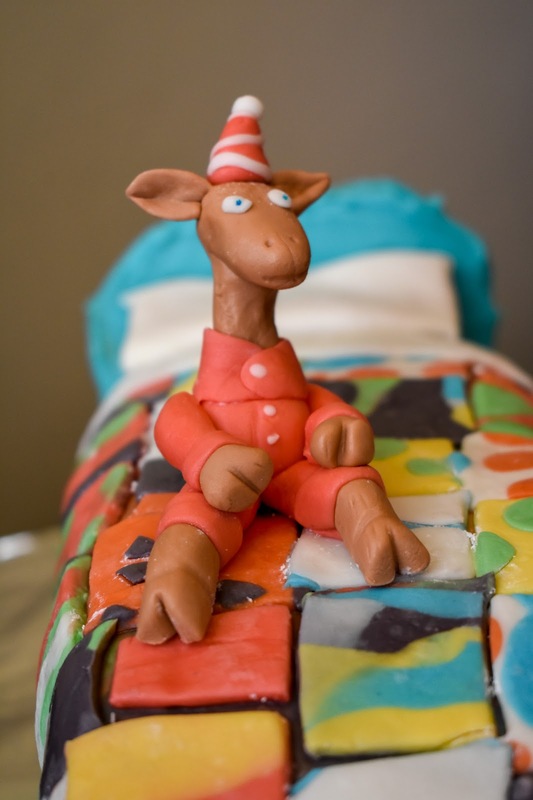 But it wouldn't have really be a Llama Llama cake without Llama Llama, would it? It would just be a bed cake and that wouldn't fit Zoë's personality because she spent the first 2.75 years of her life hating sleep. But she loves Llama Llama and that little Llama in his red pyjamas convinced her to sleep in her own bed (and go to nursery and to share and to be kind and...basically everything she knows she learned from Llama Llama) so even though I wasn't the biggest fan of all the Llama Llama sequels (the first book will always be the best), I pretty much love everything Llama Llama now (and owe Anna Dewdney a huge debt of gratitude). 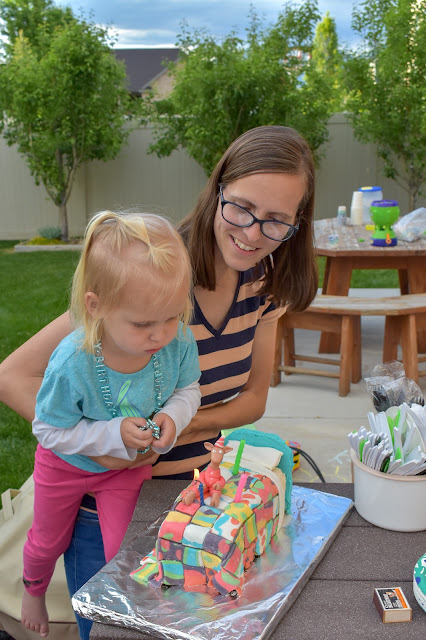 The wind snuffed one out before she could get to it, but it took her multiple tries to blow out the last two candles. Oh, and we ate the entire cake! 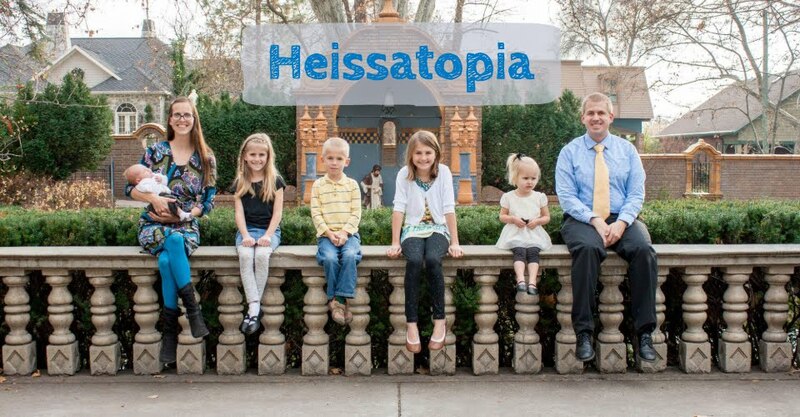 I don't think that has ever happened in the history of Heiss birthdays. We didn't gorge ourselves or anything; it's just a perk of living near family again (and a testament to how many people love her enough just to show up for a slice of cake)! 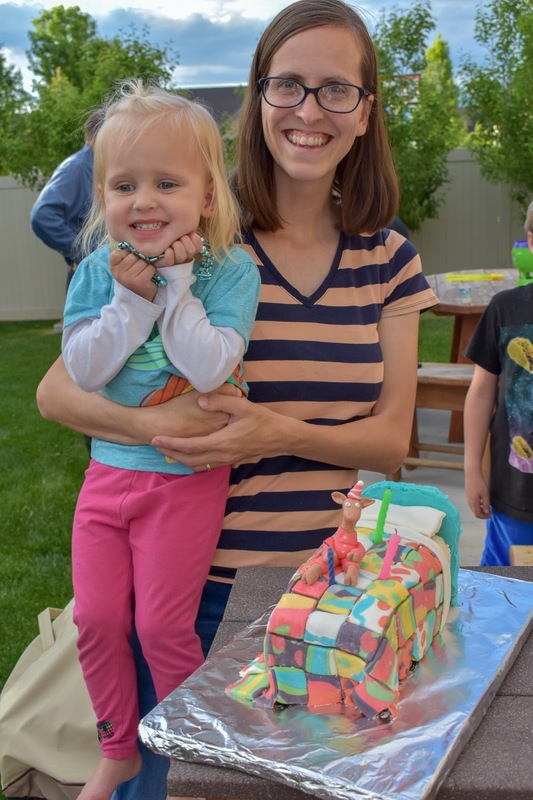 That cake was beautiful, amazing, and delicious!